Saba Ace is a product of AMS Health Sciences Inc. Their mission is to “make a positive impact on the health and the wealth of every man, woman and child in every country we do business”. To this end, Saba Ace is billed as more than just another weight loss supplement. It is part of a family of products that you can sell as a SABA business owner. 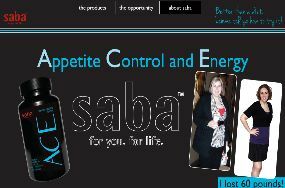 The ACE in Saba Ace stands for Appetite Control and Energy. It promises healthy weight loss, appetite control and increased energy. Does it deliver and is it worth it? Saba Ace is a capsule containing vitamins, minerals and a proprietary blend of cocoa powder, spirulina, and stimulants. On the label, the serving size is given as 2 caplets, but it is unclear how many servings are to be used per day. The official website also invites consumers to become agents – buy running a home bases business and selling to friends and relatives. It all seems a bit MLM (Multi Level Marketing) and smacks of Amway. Saba Ace lists its main ingredients as Vitamin B6, Cocoa Powder, Chromium, Spirulina, Green Tea Extract and Natural Sourced Caffeine. On the label, it also lists a proprietary formula which also contains 1,3-Dimethylamylamine HCL, trace mineral complex and phenylethylamine HCL. Vitamin B6, also known as Pyridoxine, is needed for the proper function of fats, sugars and proteins in the body, and for proper growth and development. Cocoa Powder is derived from the same plant best known as the source of chocolate. Cocoa is being investigated for many potential health benefits including treating high blood pressure and heart disease. Chromium, also known as Chromium picolinate, is a trace essential element. Claims that chromium helps weight-loss, obesity or lean body mass are disputed. Spirulina is a blue-green algae used for a multitude of conditions, including weight loss. Green tea extract has been shown in clinical studies to aid in weight loss. Caffeine is a stimulant and also has been shown in some studies to aid weight loss. Phenylethylamine HCL – also known as PEA, is an organic monoamine used as a dietary supplement to aid in weight loss and enhance mood, however when taken orally, the concentration of this drug is greatly reduced due to first-pass metabolism. 1,3-Dimethylamylamine – this popular ingredient in supplements is most likely not naturally derived. It is supposed to improve performance, but consumers should know it is illegal in some nations, and a prohibited substance to the World Anti-Doping Agency. Products containing this substance have also been banned for sale on US military bases because of possible serious side effects. There is an interesting forum discussion on the MyFitnessPal forum [source] where some users are pro and some are pointing the possible illegality of the product. Trace mineral complex – there is no information given on this ingredient beyond its name. Consumers should be wary of any undetailed formulations. The website contains numerous real-user testimonials. However consumers should understand that these happy clients may also be SABA business owners, so there may be an alternative motivation for their endorsement. Always consult with your healthcare professional before beginning any dietary supplement or weight loss program. This product is not recommended for individuals that are pregnant or breastfeeding. 1,3-Dimethylamylamine HCL has been associated with the most serious side effects including stroke, heart attack and death. Green tea extract and caffeine are stimulants and as such may cause restlessness and difficulty sleeping. People with an allergy or sensitivity to caffeine should not take this product. Caffeine and substances that contain caffeine can also cause gastrointestinal upset like diarrhoea and could complicate blood sugar control in diabetics. Chromium can cause allergic reactions in people who have leather contact or chromate allergies. It can affect blood sugar levels and has been associated with liver and kidney complications. People with diabetes, liver disease or kidney problems should avoid taking chromium supplements. Additionally, chromium can affect brain chemistry and may worsen behavioural or psychiatric conditions. Spirulina contains phenylalanine and can worsen phenylketonuria. Sufferers should avoid products containing this substance. Phenylethylamine has been used recreationally and addiction has been reported. Short answer: no. There is nothing about the Saba Ace supplement that truly differentiates it from similar products on the market. Because it is also part of a layered sales scheme, there is no up-front pricing for a bottle of ACE on the website; instead customers are presented with “opportunities” to enrol as a SABA business owner, with the cheapest starter pack starting at £40.00 / $59.00. On a major online retailer, a bottle of 60 caplets (approximately a one month supply) sells for £30.00 / $49.00. Also since this product contains the potentially dangerous 1,3-Dimethylamylamine HCL and the potentially addictive Phenylethylamine HCL, it just seems like the best bet is to look for a safer combination of ingredients in another brand. Can be ordered from the official website (or from a friend if they partake in the questionable MLM scheme). Not available in the UK high street from the likes of Boots, Holland Barrett or Superdrug. 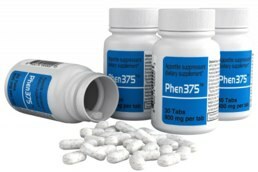 Arguably the most popular and effective slimming pill available to UK based consumer is Phen375. Phen375 is an absolute powerhouse taking ingredients from the natural world and combing them with the most potent pharmacy grade ingredients. The thing that really sets Phe375 apart is it engagement with its customer base – they actively encourage its users to send in their experiences, often by way of a video diary.